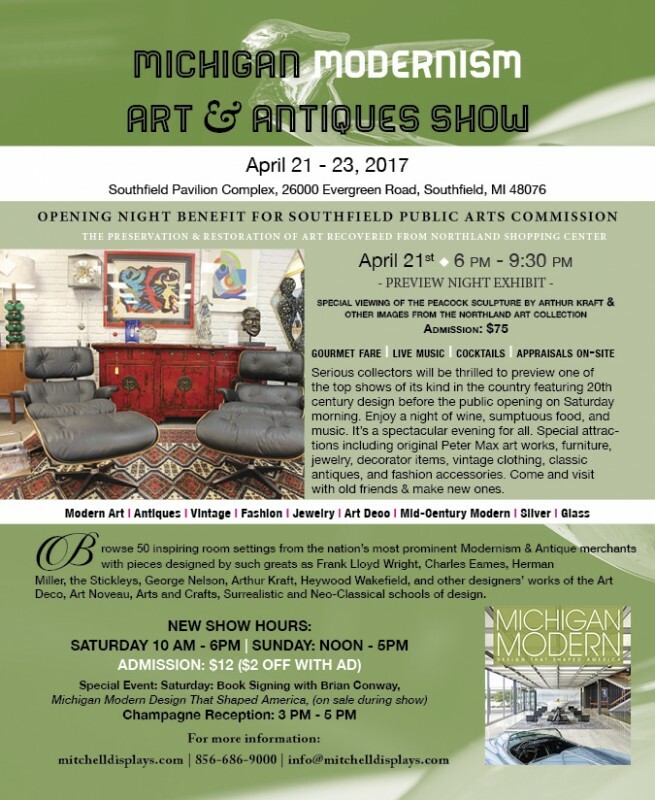 John McInnis Auctioneers held a Three Day Spring Estates Auction, March 24-26, 2017. Included in the Sunday portion of the sale was a rare and beautiful Gallé marquetry vase, lot #954. Marquetry vases are quite sophisticated. 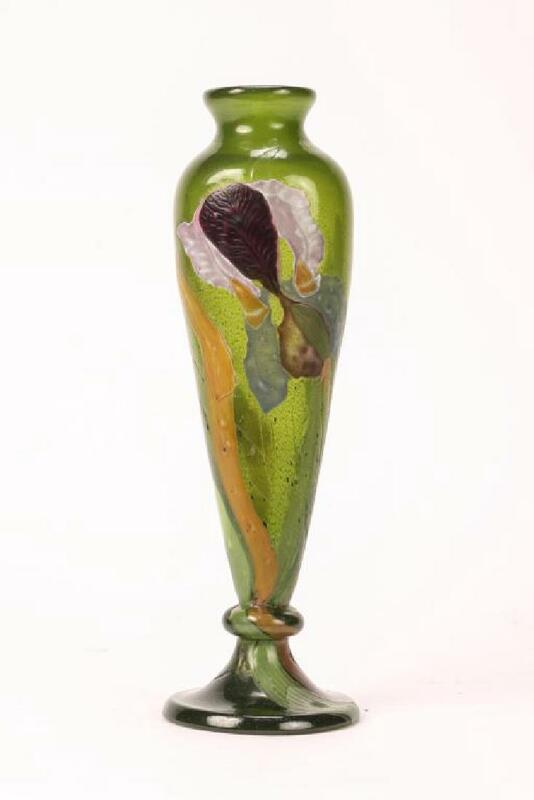 The technique required pressing colored glass into the design when the glass was molten. On cooling, the finish work was hand-engraved to give the flowers realistic details. The quality was superb. The original Gilman Collamore & Co. sticker affixed to the underside. 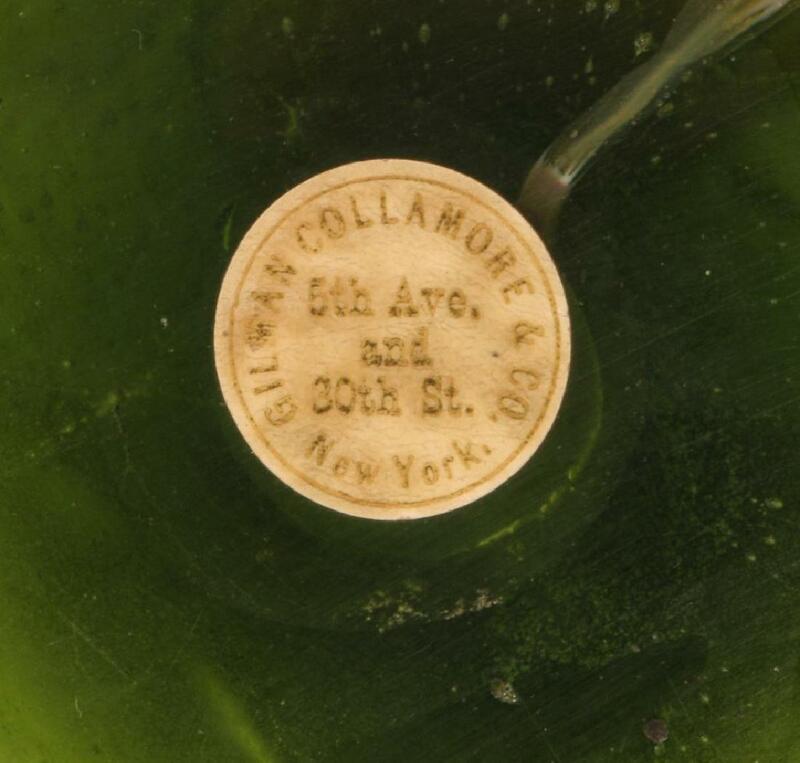 Additionally the vase had a sticker underneath from the original high-end retailer in New York City, Gilman Collamore & Co., which opened on 5th Avenue and 30th St. in 1890. I’m sure the vase’s provenance, provided by the sticker, gave a boost to its value. The bidding began at $2,000 and immediately jumped to $11,000. 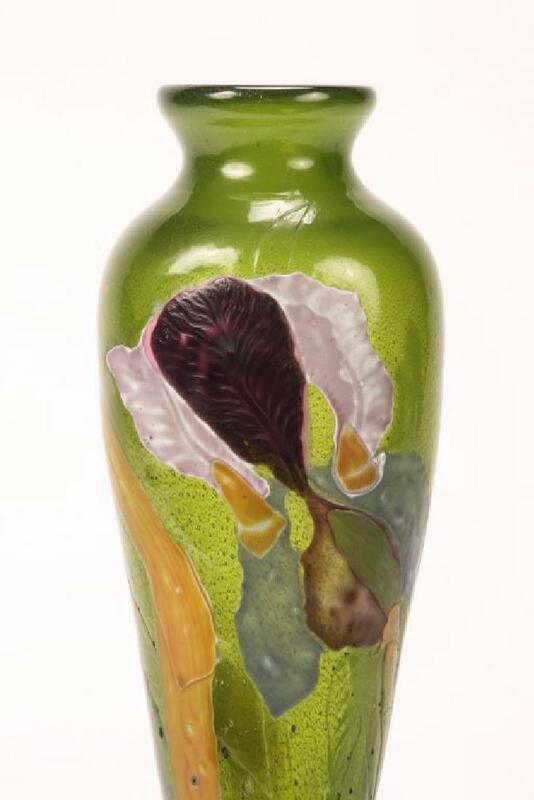 By the time it was finished, the vase sold for $44,280, including buyer’s premium, many times the pre-sale estimate of $4,000 – $6,000. I was actively bidding until $30,000, when I had to drop out. There’s only so much a dealer can pay and still make a profit. Congratulations to the successful bidder for a superb purchase. I recently listed about 15 new items on my website and I’ll be listing more in the near future. Please check my site as often as you can. 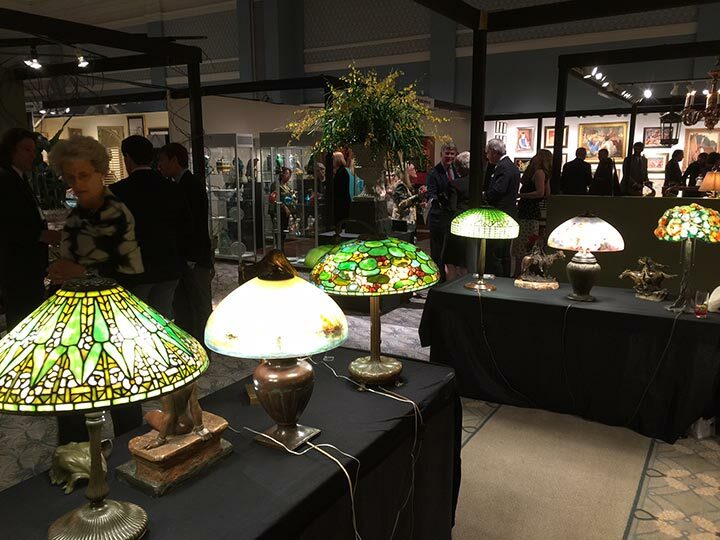 Cottone Auctions, Geneseo, NY, held its Art, Antiques & Modern Design sale on March 25, 2017. 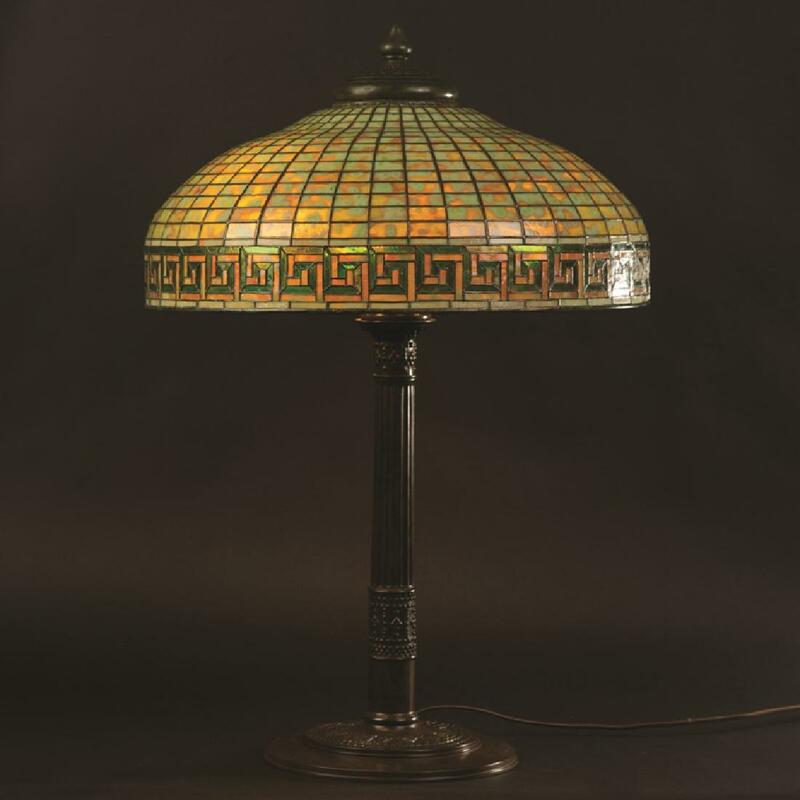 Included in the sale were several good Tiffany Studios lamps, which performed very well. The first of the group, lot #56, was a very nice quality 20″ diameter Dragonfly with beautiful mottled glass and green jeweled eyes. Estimated to sell for $40,000 – $60,000, it sold for a very healthy $80,500, including buyer’s premium. Much more surprising than the result for the Dragonfly was the result for lot #61, a 22″ diameter Greek Key lamp with superior mottled glass. It sold for an astonishing $89,125, including buyer’s premium, against a pre-sale estimate of $25,000 – $35,000. There was no way I could have predicted that. 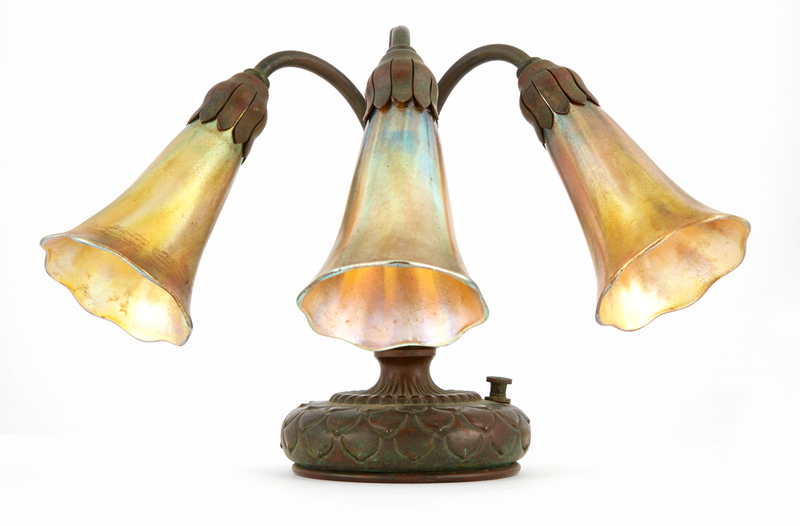 More modest results were obtained by other lamps, including a Tiffany Studios Daffodil chandelier @ $51,750. The group also included lamps by Duffner & Kimberly, Handel and Wilkinson. For the complete results, click here. DuMouchelle’s held its March auction on the weekend of March 10-12, 2017. 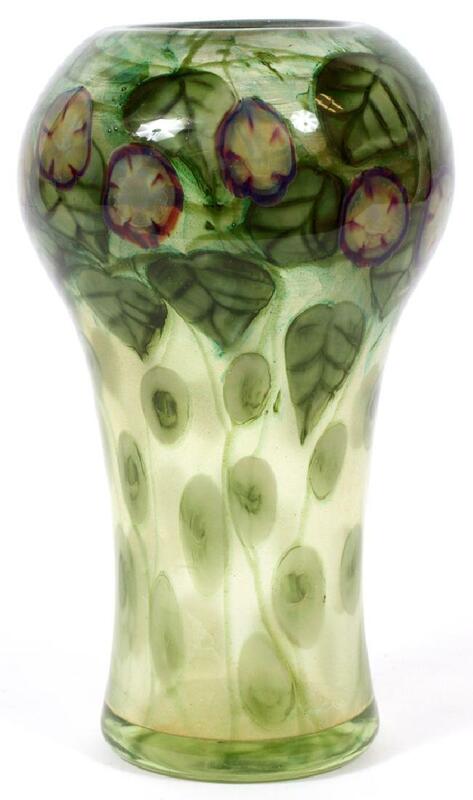 Included in the Saturday portion of the sale was a beautiful Tiffany Favrile paperweight vase, lot #1010. I was bidding on the telephone, but barely had a chance to open my mouth when the bidding flew past me. Estimated to sell for $3,000 – $5,000, it soared to $37,200, including buyer’s premium. I was left in the dust. This was a beautiful example that appeared to be in superior condition, but I was still surprised at the final price. I thought the retail value was $15,000 – $20,000. Apparently the successful bidder disagreed with me. Thursday evening, 7:50 PM. I’m starting to write this blog from the preview party on Thursday night. Those of you who follow my blog know my disdain for preview parties. Well this one is as bad or worse than most. There has been very little to no interest, so I occupy my time playing Spider Solitaire and drinking. What also makes it difficult is there are only hors d’oeuvres to eat. We will have to go to a restaurant after the preview. UPDATE: Friday, 4 PM. The show has been open since 10 AM and based upon the first day, the show will be a disaster. Not only haven’t we sold anything, we haven’t had many questions and no one seems to know what they’re looking at. I’m not completely giving up hope, but it’s not looking good. On the other hand, the show promoters have set aside a room for dealers to rest and eat a complimentary, lovely lunch each day. Very nice. UPDATE: Saturday, 12 PM. Well, what do you know? 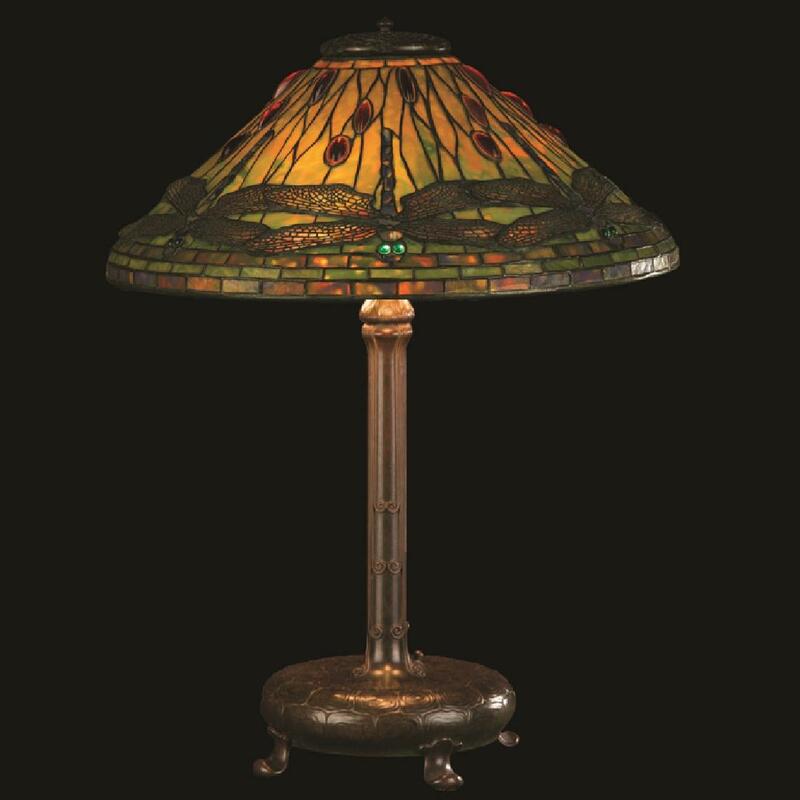 We sold a Tiffany lamp to a lovely lady visiting from Missouri. At this point, we’re breaking even. If we sell something else, we’ll actually earn a profit. That would be a pleasant surprise. UPDATE: Sunday, 5 PM. The show is over and the verdict is in. We will not be returning to exhibit in Charleston. One sale, which covered our expenses, is no reason to return to a show. There was a distinct lack of interest and knowledge. We only had a few questions in three days. Too bad, because everything about the show was nice, except the lack of business. After a very difficult week that started with truck trouble, we will exhibit at the Charleston Antique Show this coming weekend. We had to leave most of our supplies in the truck, and two-thirds of our merchandise in New York, so our exhibition will be improvised. We had to buy all the basic supplies we always carry, like light bulbs, electric wires and fabric. We were able to rent a single showcase from a local dealer. But now it’s all new, so after exhibiting at hundreds and hundreds of shows, it’s like starting all over again. I’m not a fan. The show opens with a preview party on Thursday night. I can’t tell you how thrilling that is. NOT! Then the show opens to the public on Friday at 10 AM and closes on Sunday at 5 PM. Charleston is a very nice city and I expect the public to be very friendly and courteous. What I don’t expect are sales. Exhibiting in Charleston was a shot in the dark, but not having our usual display makes me truly apprehensive about the results. I hope I’m wrong, but I think this show will not end well. Tune in on Monday for the results. We’re scheduled to exhibit at the Charleston Antique Show this week, March 17-19, 2017, but it’s not sure at this moment. Not that we don’t want to, just that circumstances may prevent us. My driver, Bill, showed up on Saturday to load the truck for our trip. The problems started immediately when the truck wouldn’t start. We finally brought a mechanic to the truck and he diagnosed a frozen starter motor. Since it was Saturday afternoon, we couldn’t get the part and would have to wait for Monday morning. We were scheduled to fly to Charleston on Tuesday to begin setting up the show on Wednesday, but as you probably know, a huge Nor’easter is bearing down on the Northeast. So we were forced to fly to Charleston yesterday. Now we’re in Charleston and I’m biting my nails awaiting word from New York that the mechanic was able to fix the problem. If Bill can load the truck and start driving by the afternoon, he just might be able to beat the brunt of the storm which threatens tremendous snow and wind from Washington, DC, to Boston. UPDATE: Monday, 6:00 PM. The situation with the truck went from bad to worse. The truck couldn’t be started. It was towed to the dealer for repair. So we had to go to Plan B, take the van, with no showcases. So we’re going to exhibit at the show with tabletop lamps and glass. That is assuming Bill makes it safely through the storm. He left New York about 5 PM. Another update tomorrow. UPDATE: Tuesday, 2:00 PM. It’s still up in the air if we can exhibit at the show. Now the van has transmission trouble and it’s 60/40 if Bill can make it all the way to Charleston. He’s in North Carolina at the moment, so I’ve got my fingers crossed. UPDATE: Wednesday, 7:30 AM. The transmission on the van held up and Bill made it to Charleston. We were able to rent one showcase, so we’ll have a modified display, but not our usual. To make things worse, the problem with the truck was the starter motor. The mechanic who came to change the starter motor on the truck misdiagnosed the problem. Had he actually replaced the starter motor, we would have had the truck and all of our showcases, but that’s life. We have to play the cards we’re dealt. 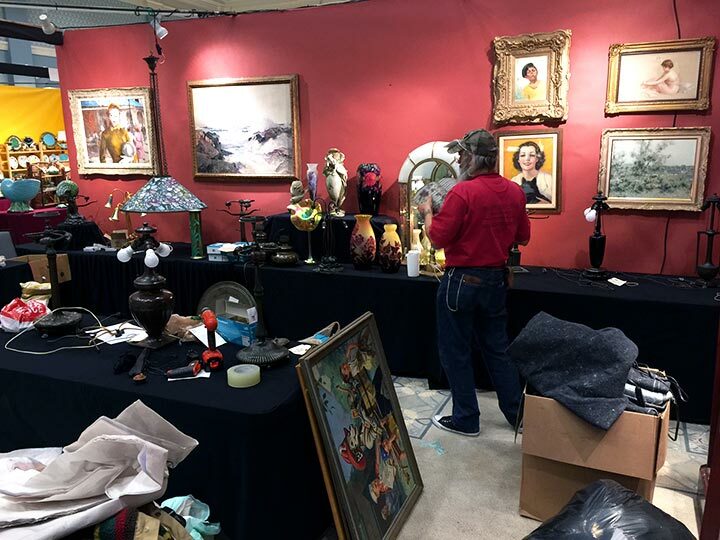 Doyle New York held its Doyle at Home sale yesterday, March 8, 2017. 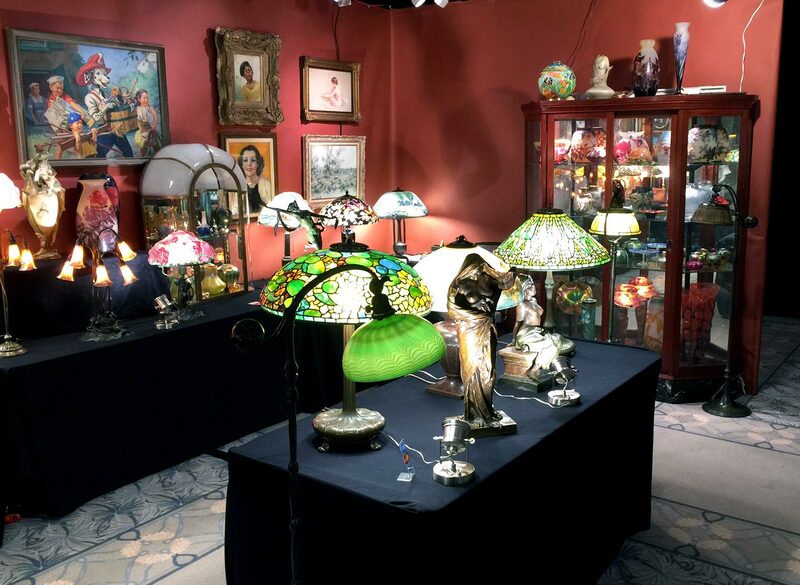 Included in the sale was a small selection of mostly mediocre French, Austrian and American art glass and lamps. 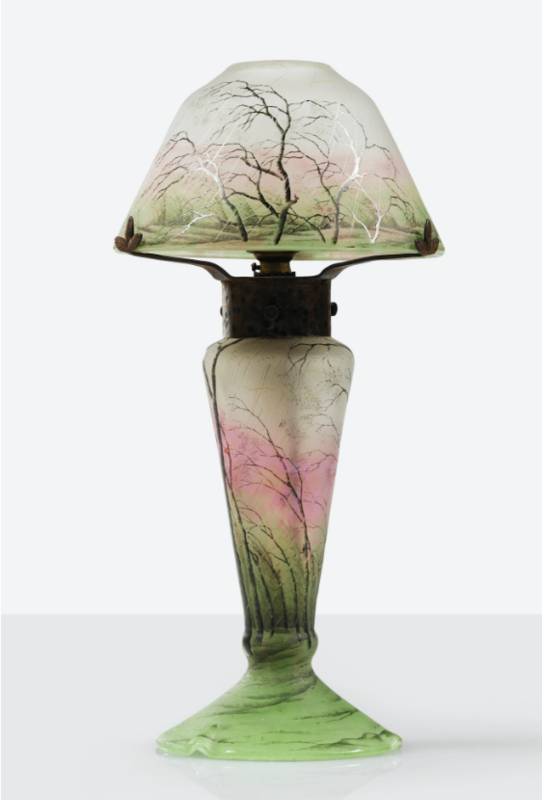 Doyle used to include this type of merchandise in its 2-3 times yearly Belle Epoque sales, but all of the auction houses have moved to Design sales instead. 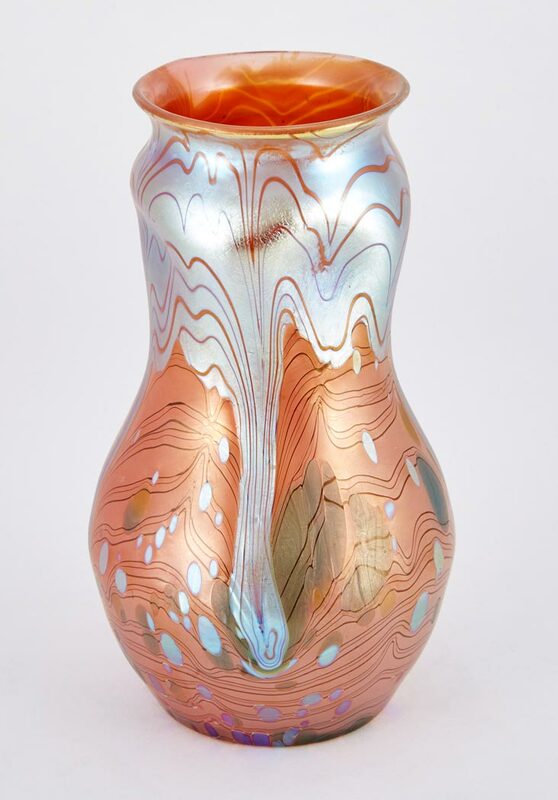 Lot #229 was a standout Loetz 7¾” Phänomen vase with drip decoration, on a salmon-colored ground. Estimated to sell for $800 – $1,200, it realized $5,312, including buyer’s premium. 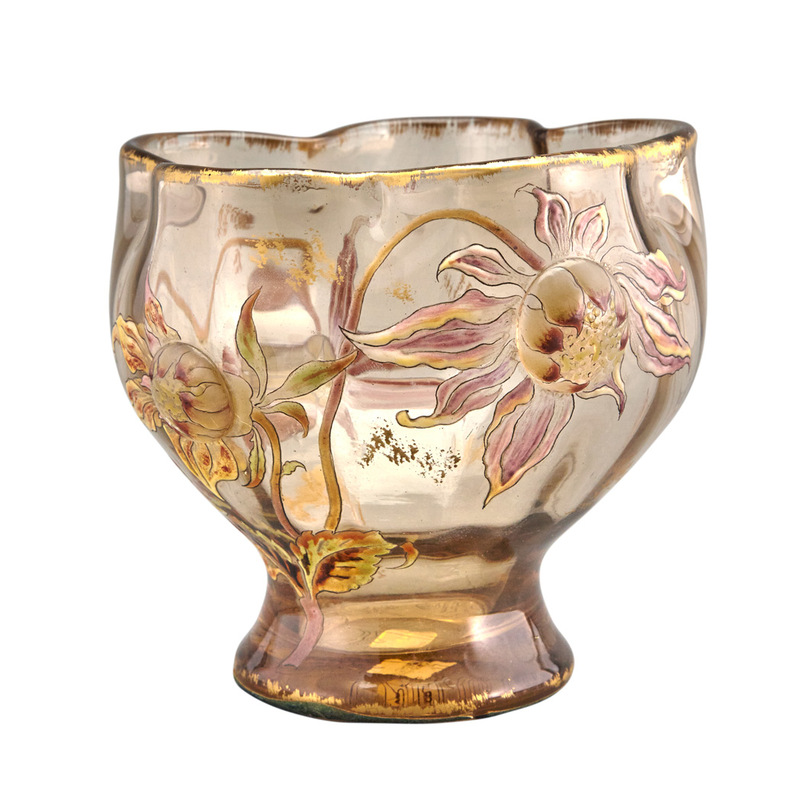 Lot #226 was a nice 19th century example of Gallé Crystallerie production, which was usually clear glass with enameling. This smallish 5½” example also had applied cabochon flower centers, improving its beauty and sophistication. It sold above its high estimate of $1,500, realizing $2,125, including buyer’s premium. The Tiffany Studios offerings were mostly low quality, reflected in their middling results. 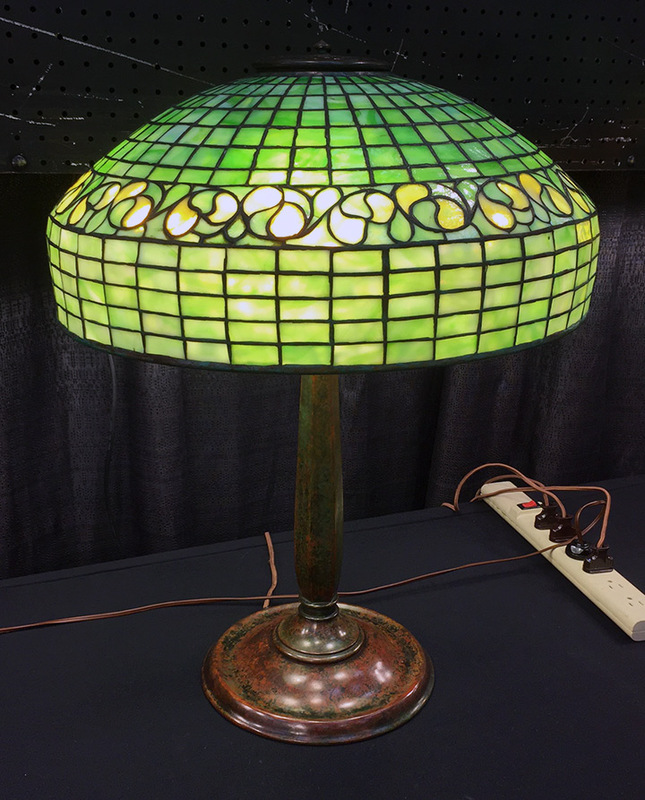 Lot #526, a Tiffany 3-light lily piano lamp, did OK, considering that one of the three shades was badly damaged and held together with tape. It sold for $4,375, against a pre-sale estimate of $1,500 – $2,500. 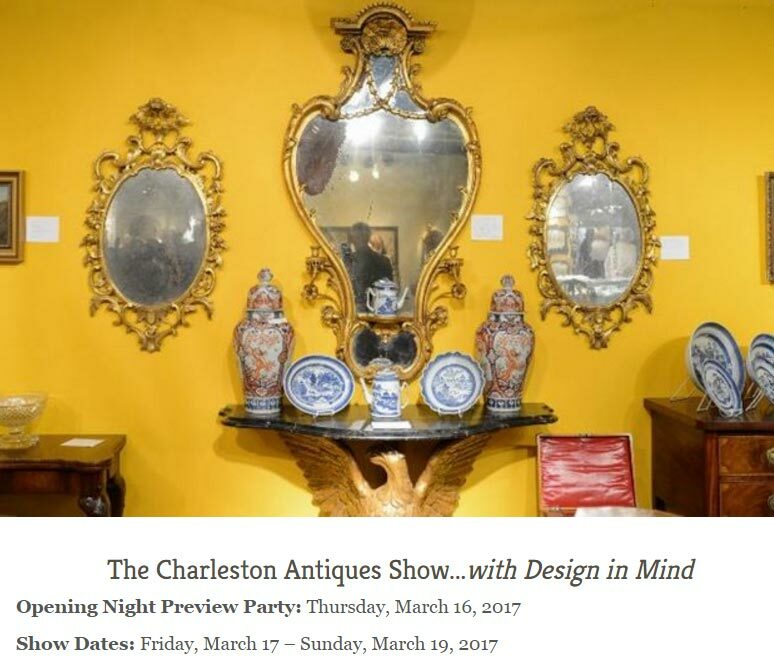 Next week we’ll be exhibiting at the Charleston Antique Show in Charleston, SC, March 17-19, 2017. I have no idea what to expect since I’ve never exhibited there, but I figure it’s worth a shot. I have low expectations and am hoping for a nice surprise. 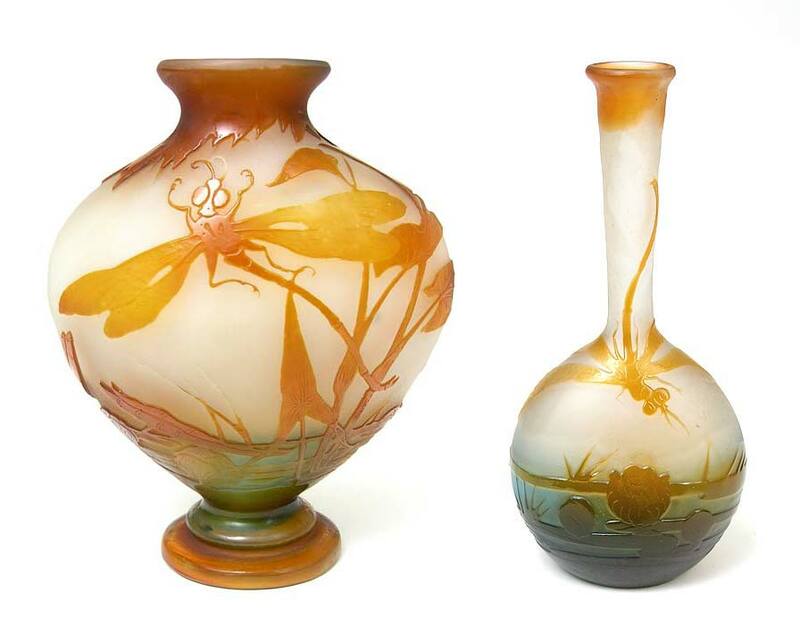 Most of the French cameo glass companies of the Art Nouveau period repeated subject matter on vases and lamps of different sizes and shapes. Some collectors like to create groupings, usually odd numbers of at least three. I recall one Florida collector who collected only Daum Winter vases and lamps. I think she had over 70 examples by the time she stopped collecting in the 1980s. 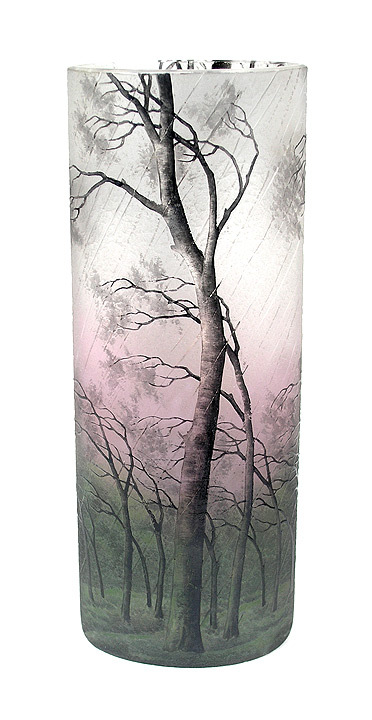 Rain is one of the rarest and most highly sought after subjects for Daum glass. It can be found on many shapes from as small as miniature vases, all the way up to large vases and lamps. Gallé liked dragonflies, which were usually depicted flying over water lilies. Gallé produced very few miniature vases, but dragonflies can be found on small to monumental vases. The addition of a dragonfly to the decoration of a vase can double its value. There are as many ways to collect glass as there are collectors. Everyone’s idea of what makes a nice collection varies, but collecting groupings can be a nice way to add a little variety. Hello from Oslo, Norway, our last day here. We came to chase the Aurora Borealis (Northern Lights). Were we successful? Well, yes, kinda, sort of. We arrived in Norway in the city of Bergen, where we started our journey on a cruise ship line called Hurtigruten. Our specific ship was called Finnmarken. 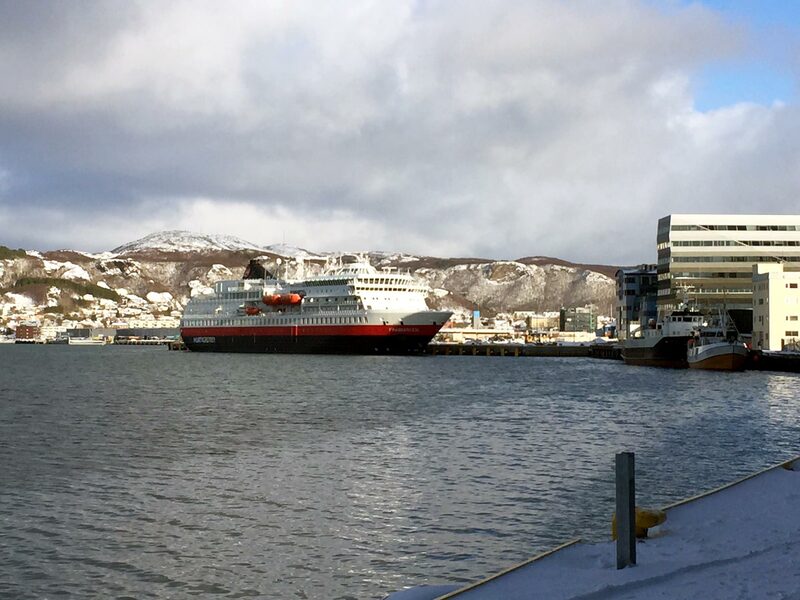 The Hurtigruten ships cruise the coast of Norway starting in Bergen north to Kirkenes, then turn around and head south. Besides cruise ship passengers, they’re working ships that stop in many ports along the journey. You can get on and off at any port. 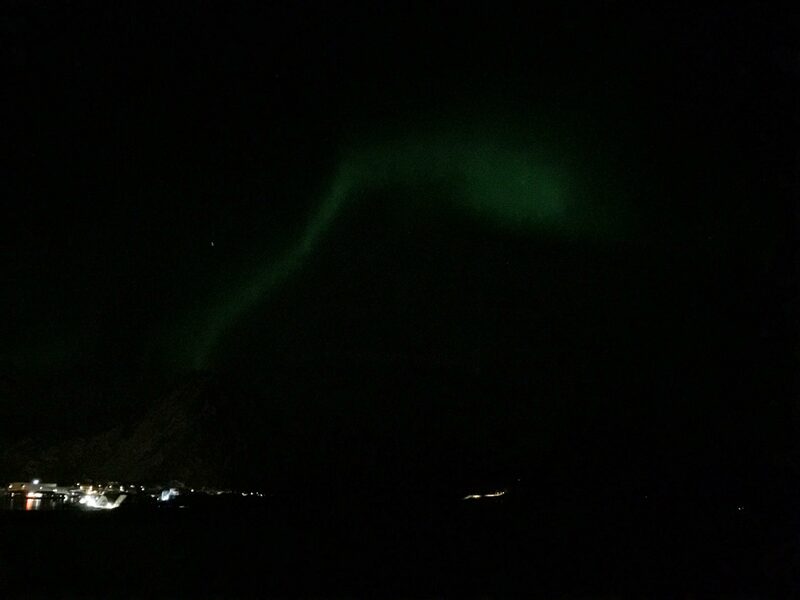 We didn’t have any chance to see the Northern Lights until we passed north of the Artic Circle, after a few days traveling. It turns out we were north of the Artic Circle for only three nights, even though our entire trip was ten nights. Bad planning. If we were to do a similar trip again, we would just fly to a city north of the Arctic Circle, for instance Tromso, Norway, and stay there for several nights. All the stars have to align to see the Northern Lights. 1. You need to be north of the Arctic Circle (most of the time). 2. It’s best to go in winter when the skies are dark. 3. It’s best to go when the moon is new, so it’s dark. 4. Going to a dark area outside of a city is best. 4. The weather has to cooperate, so cloud cover is a no-go. 5. Auroral activity should be at least moderate. The Kp-index is a measure of the activity, on a scale from 0 to 9. The higher the number, the better the chances and the brighter the display. That’s a lot of stars to align to get a good viewing. So most of the factors aligned for two of the three nights, but the biggest factor working against us was the low auroral activity. 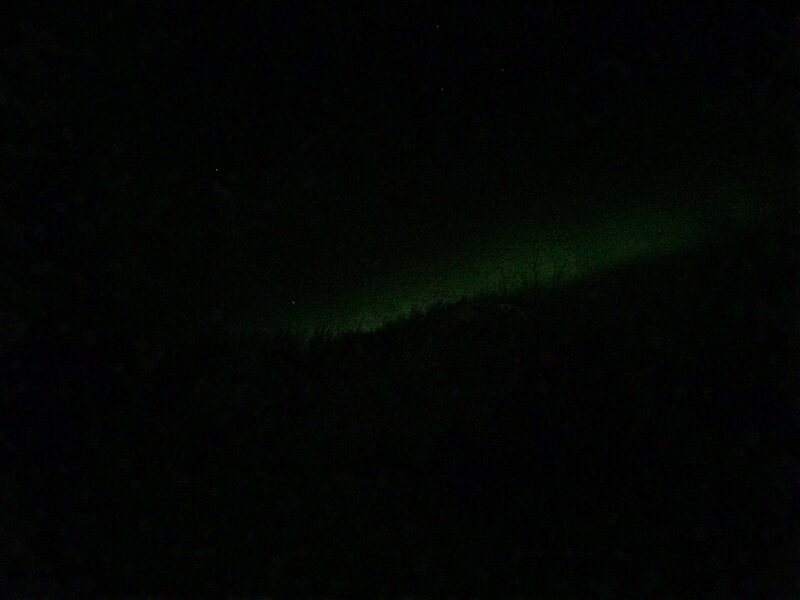 The Kp index was between 1 and 2, so the little bit of Northern Lights we did see were faint and totally unspectacular. Boo hoo. We tried and we’ll probably try again, but now we’re a little smarter. 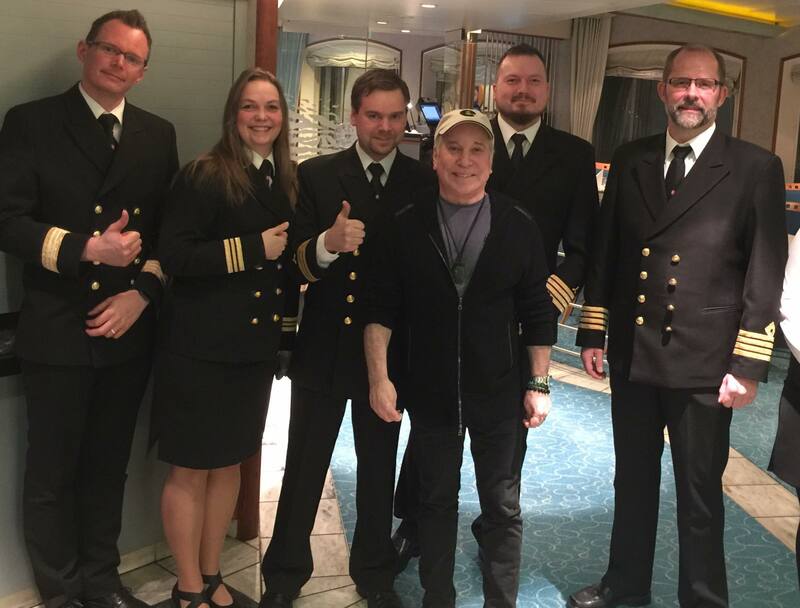 To top things off, we found out that Paul Simon was on the next northbound Hurtigruten ship, the MS Trollfjord. Apparently he had his guitar with him and sang for the guests. Wow! 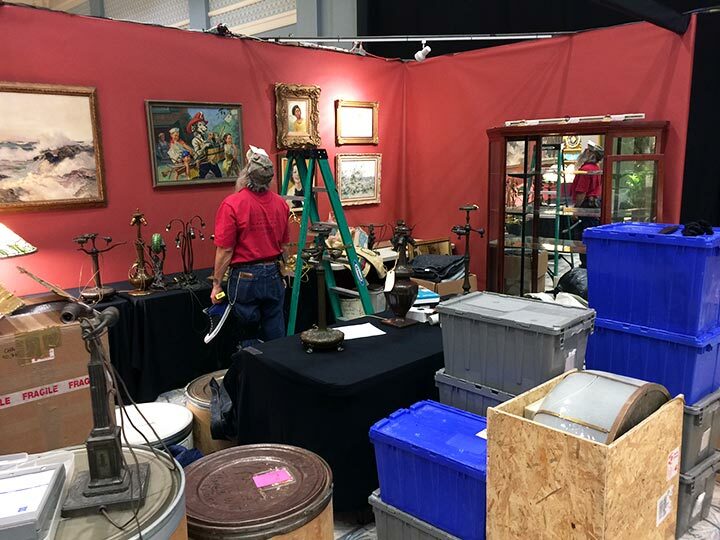 We’ll start preparing for our next show in two weeks, the Charleston Antique Show in Charleston, SC, March 17-19, 2017. I have no idea what to expect since I’ve never exhibited there, but I figure it’s worth a shot. I have low expectations and am hoping for a nice surprise.